$799 is a nice price, but keep the charger handy. With its thin-and-light shell, jumbo display, Intel Core i7 processor and mid-range price tag, the Asus VivoBook S510 aims to be a sleek-yet-roomy ultrabook for folks who like to get things done. But while we're impressed by its looks, feel, and agility with day-to-day office tasks, the S510 falls painfully short in a key area: battery life. We tested the $799 version (SKU S510UA-DB71) of the VivoBook S510, which measures 14.2 x 9.6 x 0.7 inches and weighs just 3.7 pounds (or 4.1 pounds with the compact power brick). That's surprisingly light for an ultrabook with a 15.6-inch display—typically, we’d expect an ultrabook of this size to exceed four pounds. Weighing in at just 3.7 pounds, the VivoBook S510 is much lighter than we expected. Inside the case sits a 2.7GHz Intel Core i7-7500U, a dual-core processor optimized for relatively low-power mobile performance. Also on board: 8GB of DDR4 2133MHz memory, a 128GB solid-state drive and a 1TB hard disk drive. While theoretically you could upgrade the S510’s memory or storage, there are no easy-access panels; instead, you'll have to remove 10 screws to crack open the laptop's bottom shell. The VivoBook’s integrated Intel HD Graphics 620 core is designed to handle everyday display tasks like web browsing, video streaming and general productivity. (We'll have more to say about its real-world performance in a moment.) If you're looking to fire up some games, a slightly pricier version of the S510 (SKU S510UQ) with discrete Nvidia GeForce 940MX graphics recently appeared in retail channels. The VivoBook S510’s 15.6-inch display looks reasonably bright and sharp, particularly for standard Office and desktop tasks. Switching over to Netflix, the dark-greenish world of The Matrix lacked the inky black levels you might see on a pricier laptop, but the noir-drenched images didn’t look distractingly gray, either. And while the VivoBook’s 1080p resolution won't turn any heads in today’s 4K-obsessed world, you can’t expect much more given the S510’s sub-$800 price tag. The S510’s viewing angles weren’t too shabby. Yes, the screen dims noticeably when viewed from about a 30-degree angle from the center, side to side or top to bottom, but charts, documents and images are still easily viewable, and colors don't invert when you tilt the screen up. While I'm happy with the VivoBook's viewing angles, the screen as a whole is on the dim side. The S510's display brightness peaks at about 257 nits (or candelas), a figure that skims our minimum standard for a comfortably bright laptop display indoors. Outdoors, ambient light could easily overwhelm this display, even if it's only partly sunny. The S510 boasts typical chicklet-style keys on its roomy, backlit keyboard. The keys themselves are pleasingly snappy, with decent travel and an ever-so-slight concave feel. That said, typists with a tendency to pound the keys (I’m raising my hand) may notice that the keyboard feels a tad bendy in the middle. The S510's roomy keyboard makes for comfortable typing, and the trackpad's build-in fingerprint reader is a nice bonus. The keyboard boasts function keys for putting the S510 into sleep or airplane mode, plus a few other function key-enabled shortcuts that disable the touchpad, turn off the display, and change your external display settings. 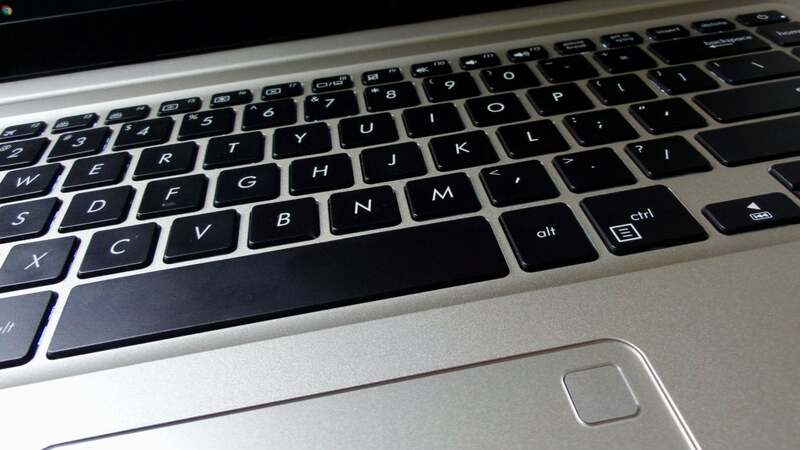 The laptop's power button is integrated into the top-right corner of the keyboard itself, although thankfully not right next to the Backspace key. Search and settings shortcuts are missing in action, as is a dedicated numeric keypad. The smooth, responsive trackpad on the S510 comes with a bonus: a built-in, Windows Hello-compatible fingerprint reader in the top-right corner, which lets you unlock your Windows user profile as well as log in to any Windows Hello-enabled apps. Once the S510’s fingerprint reader scanned my fingerprint, the sensor recognized my fingertip in less than a second, and it never failed during my testing. 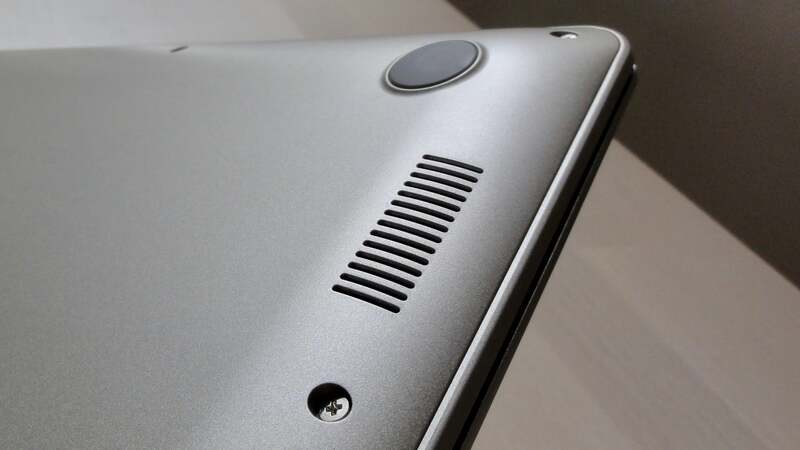 The VivoBook S510's speakers sit on the bottom of the laptop, near the front. The S510’s stereo speakers sounded a bit cleaner and crisper than expected for a laptop, with a welcome hint of bass (and I do mean a “hint” of bass, as opposed to "mega" bass). Cranked at full volume, the speakers were hit-and-miss; “Live and Let Die” by Paul McCartney & Wings sounded loud and clear, but the left speaker crackled noticeably during a Deutsche Grammophon recording of early Mozart symphonies. The S510’s VGA webcam is...well, a VGA webcam, delivering grainy, blotchy video that's passable for basic video conferencing but little else. The VivoBook S510 comes with a solid selection of ports, starting with two USB 2.0 Type-A ports and an SD card reader on the left side. 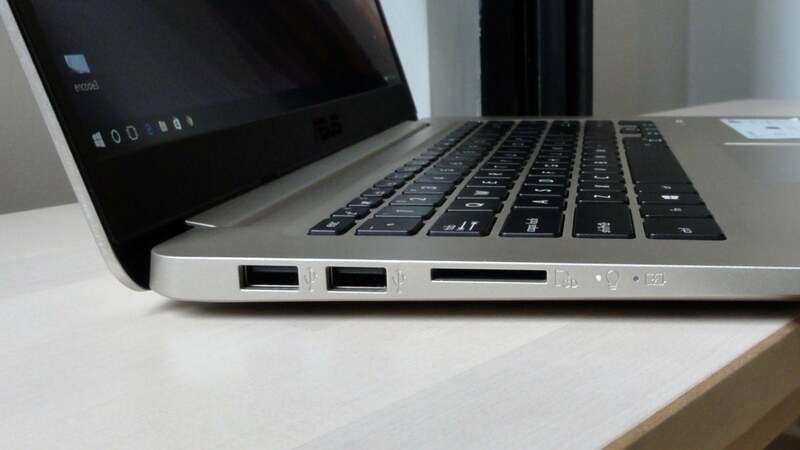 A pair of USB 2.0 ports and an SD card reader grace the left edge of the VivoBook S510. On the right, you'll find USB 3.0 Type-A, USB 3.1 Gen 1 (5Gbps) Type-C, a full-size HDMI port and a headphone jack. 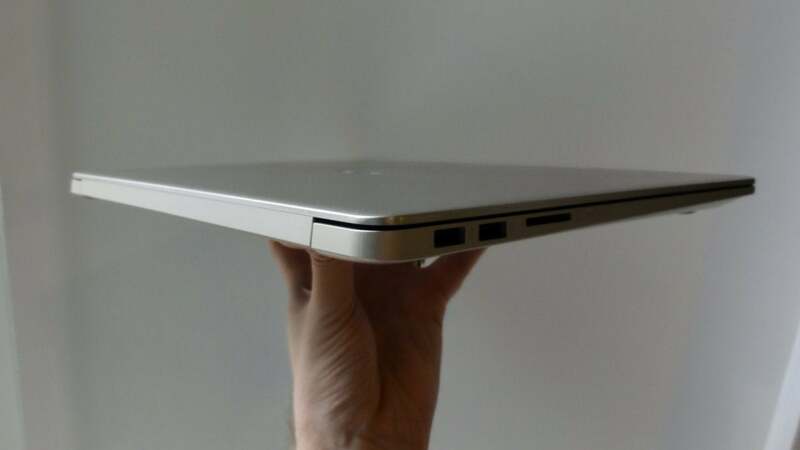 No mini-DisplayPort, VGA or ethernet, but that’s not terribly surprising for the slim chassis of an ultrabook. 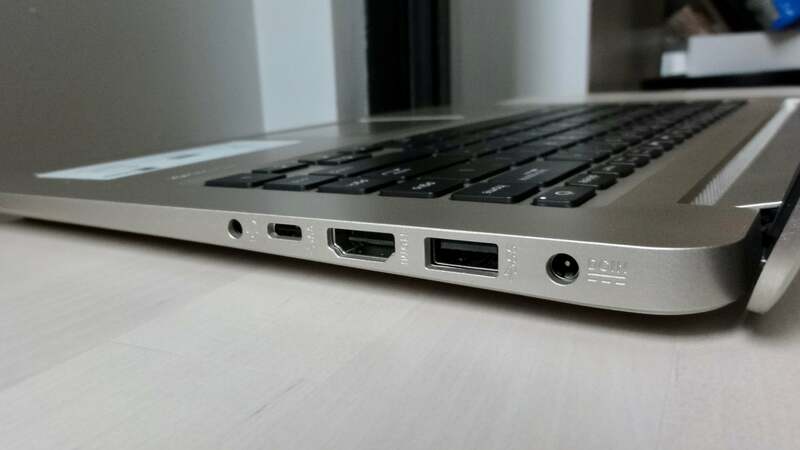 USB 3.1, USB 3.1 Gen. 1 Type C, HDMI, and a headphone jack comprise the VivoBook S510's right-side ports. The Core i7-7500U powering the VivoBook S510 performed predictably for a dual-core chip: peppy for the everyday stuff, but sluggish at the more demanding, CPU-intensive chores that quad-core ultrabooks perform with ease. 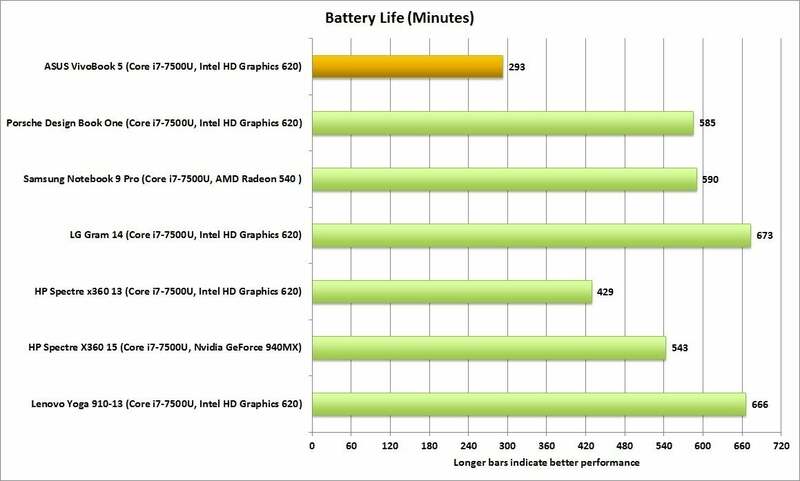 We didn't expect to be so disappointed by the S510’s battery life, unfortunately—more on that below. 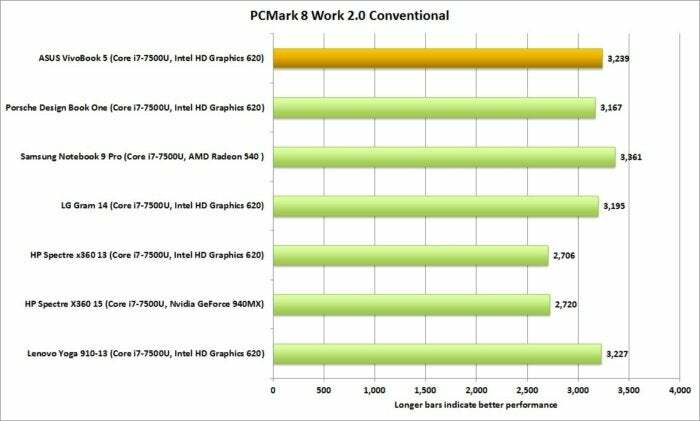 First, we put the S510 through its paces with PCMark 8 Work 2.0 Conventional, a test that simulates such office chores as web browsing, word processing, and spreadsheet-based number crunching. Generally speaking, a laptop needs to clear a score of 2,000 to perform office duties smoothly. The Asus VivoBook S510 logged a good score in PCMark 8 Work 2.0 Conventional, as expected from a dual-core chip doing mainstream tasks. With its score of 3,239, the VivoBook S510 more than makes the grade, posting one of the faster scores compared to similarly configured laptops. Next up: our HandBrake benchmark, a more demanding, CPU-intensive torture test in which we encode a 30GB MKV video file. The Handbrake test tells us a lot about how a laptop handles crushing CPU loads: Does it spin up its fans and melt the case? Or does it tap the brakes to keep things cool? The Asus VivoBook S510 hung back a little bit compared to similarly configured laptops in this CPU-intensive test, probably sacrificing power to control heat. 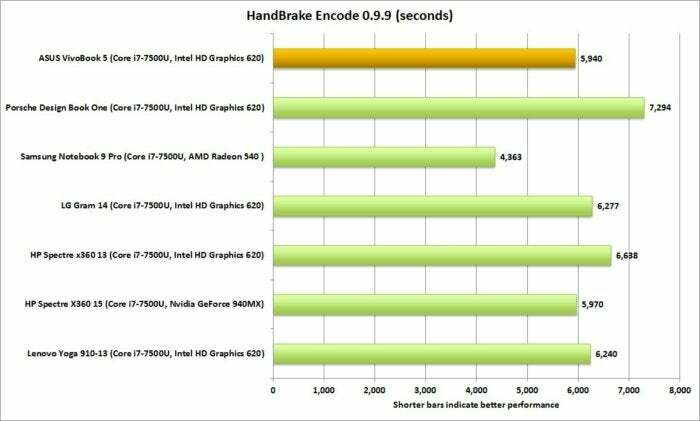 As its middling HandBrake score suggests, the VivoBook S510 splits the difference between excessive heat and performance. Yes, the S510’s fans began to whir and its chassis warmed up during the Handbrake test, but after a quick CPU burst at its top speed of 3.50GHz, the S510’s dual-core i7 processor leveled off at about 3.05GHz, well shy of its maximum. 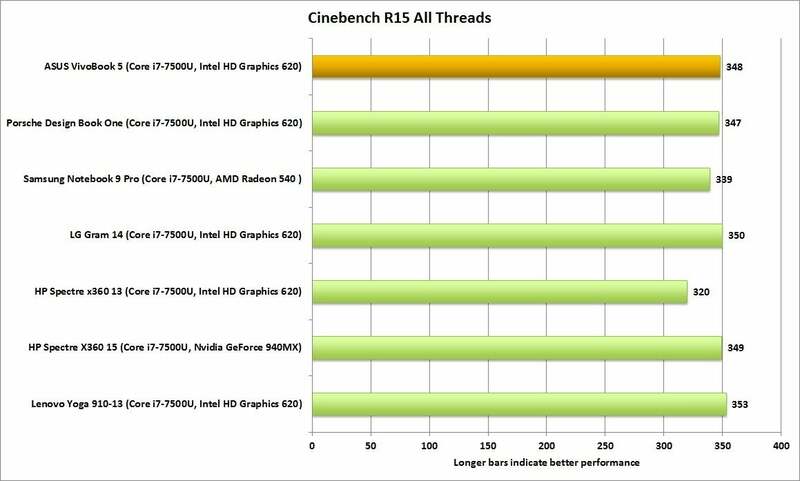 The S510’s HandBrake results were mirrored in our Cinebench R15 test, another CPU-intensive benchmark that pushes a laptop’s processor to its limits as it renders a 3D image. The Asus VivoBook S510 kept pace with its cohort in the Cinebench R15 test, but what isn't shown here is how a quad-core laptop could leave them all in the dust. Once again, the VivoBook S510’s dual-core i7 processor briefly gunned to its top 3.50GHz speed (and yes, its fans revved up to compensate), and once again, it soon dialed itself down to about 3.05GHz. 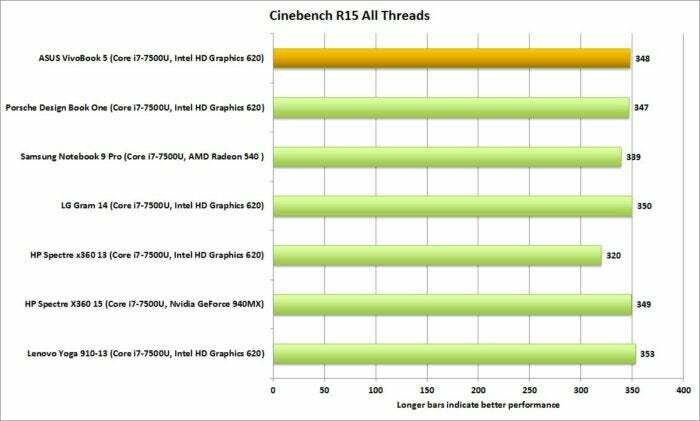 The S510’s Cinebench score is pretty much in line with other recent dual-core i7 laptops we’ve seen, but none could compete with a quad-core laptop. 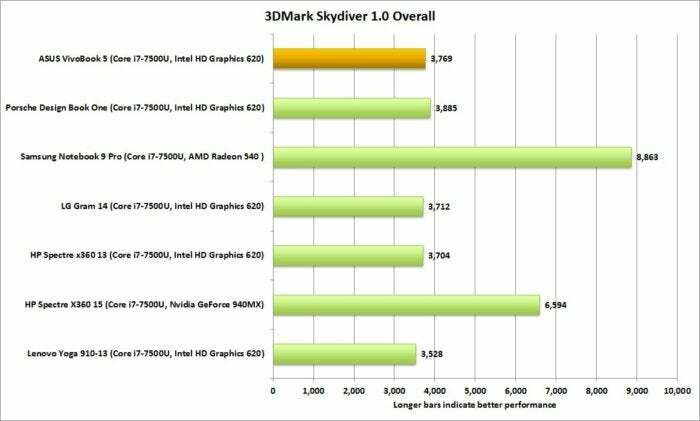 We didn't expect the VivoBook S510 to rattle any cages in terms of graphics performance given its Intel integrated graphics core, and its test results with Futuremark's 3DMark Sky Diver benchmark confirmed our suspicions. 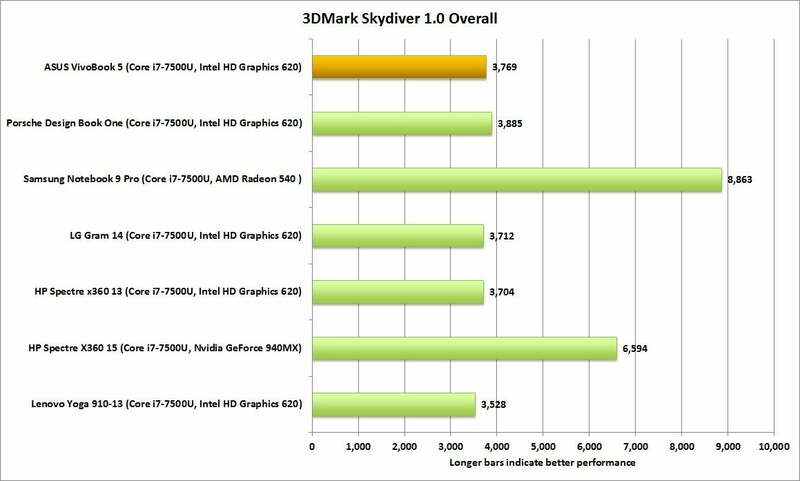 Discrete graphics makes the difference in tests like 3DMark Skydiver. The Asus VivoBook S510 could handle low-end to moderate gaming, but that's about it. With an overall score of 3,769, the VivoBook S510 is (again) in line with competing laptops using Intel HD 620 graphics, but far short of similar-spec'ed ultrabooks with one key difference: discrete graphics. So no, it won't be running Destiny 2 or Overwatch at a silky-smooth 60 frames per second on max settings, but some dialed-down Diablo 3 or Minecraft isn’t out of the question. Battery life is where the Asus VivoBook S510 gets interesting, not to mention disappointing. We test a laptop’s battery life by looping a 4K video file using the Windows 10 Movie & TV app, with the volume on halfway (we kept a pair of earbuds plugged in) and the display tuned to about 250 nits. In the S510’s case, that means the brightness setting was almost fully cranked. 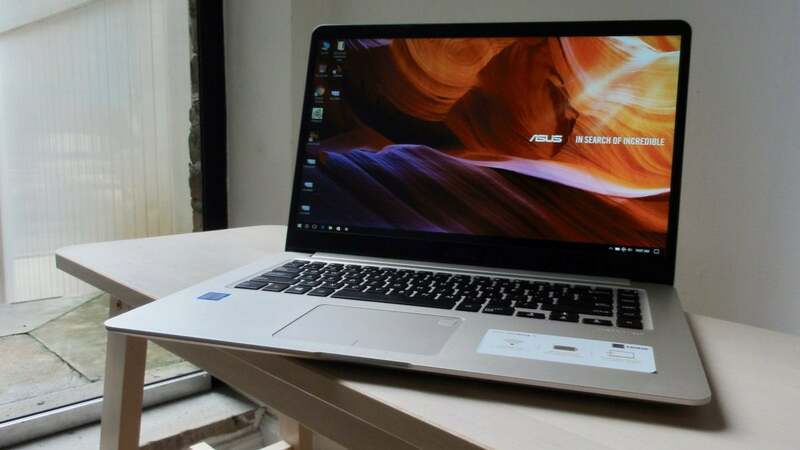 The Asus VivoBook fell far behind its closest competition in our video rundown test, lasting a shockingly scant five hours rather than the expected eight or nine. Normally, we expect a laptop of the VivoBook’s size and weight class to survive our battery drain test for a good eight or nine hours. Unfortunately, the S510 conked out just shy of five hours. What gives? According to the Windows Task Manager, the S510’s CPU speed rarely rose above 1.5GHz during the test (which is actually much lower than the CPU's 2.5GHz-ish idling speed), so a hyperactive processor isn’t to blame. A more likely culprit is the 15.6-inch 1080p display, which must be dialed all the way up to meet our minimum standard for indoor brightness. The $799 VivoBook S510 entices with its 15-inch display, peppy productivity performance, and solid selection of ports, all crammed into a sleek 3.3-pound shell. Unfortunately, it's hobbled by poor battery life.